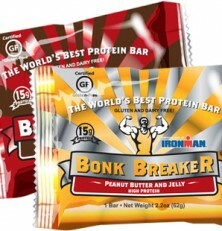 The “Official Energy Bar of Ironman®,” Bonk Breaker gives you the sustained energy you need, and a taste you’ll crave even after your workout. Every Bonk Breaker is Gluten & Dairy Free and baked fresh weekly! Building muscle never tasted so good! INGREDIENTS: B-Breaker TM (Rice Nectar, Natural Crunchy Peanut Butter [Peanuts, Salt], Honey), Organic Gluten Free Oats, Non GMO Brown Rice Protein, Strawberry Jam (Strawberries, Fruit Pectin, Glucose Syrup), Flaxseed Meal, Rice Crisps (Rice Flour, Rice Nectar, Salt), Sea Salt. Gluten-Free, Dairy Free, & Soy Free. Contains Peanuts. Made on equipment that also processes nuts. 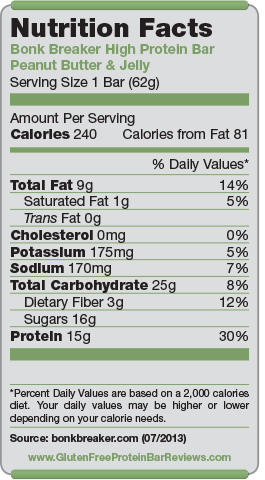 Nutrition facts based on Peanut Butter & Jelly flavor. Facts and ingredients vary by flavor. Bonk Breaker energy and high protein bars fuel top professional, Olympic, and elite level teams and athletes around the world. Just as importantly though, we’re the fuel of choice for weekend warriors, families, and anyone looking for a tasty and nutritious snack. 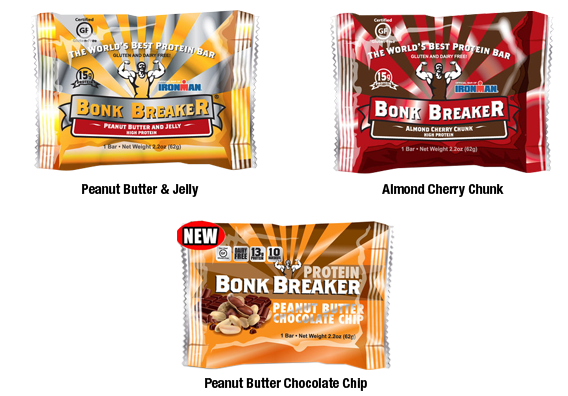 Reading through many different reviews, Bonk Breaker seems to be THE bar for runners and bikers before or during exercise. Bike Stores are also a good place to find these bars locally. Athletes mentioned that these bars are giving them much needed energy for long runs and rides. The bars taste fresh and are very flavorful and moist. All the reviews we looked at had only good things to say about the taste for these bars. Different flavors preferred by different people of course. Moist and grainy texture. Soft and smooth, a little sticky. Size and shape is similar to a Clif Bar. 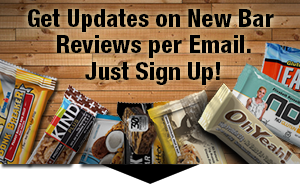 Buyers report that bars are easy to digest and that it was good on their stomachs even during exercise. A little on the high side with $3.25 per bar at retail. Repeat buyers should look at cheaper options online or wait for specials. We tried the Almond Cherry Chunk ourselves and we liked it a lot. Funny thing is, we’ve had it for a while and by the time we ate it, it had already expired by a month or so. And even after being overdue for a month, the bar tasted incredible fresh and moist. 4.5 stars from us! They just need to work on the price a bit more.